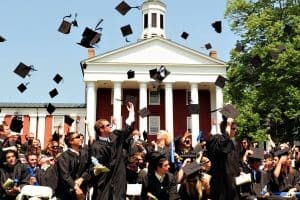 Washington and Lee University celebrates its 230th undergraduate commencement Thursday, May 25, when it will award bachelor’s degrees to more than 440 students. University President William C. Dudley will address the graduates at the 10 a.m. ceremony on the Front Lawn of the main campus. J. Wilson Miller, past president of the Executive Committee of the student body and a graduating senior from Dallas, Texas, will speak on behalf of the Class of 2017. Commencement festivities begin Wednesday, May 24, at 10 a.m. on the Front Lawn with the traditional baccalaureate service, featuring speaker Rebecca Linder Blachly. Blachly is the director of the Office of Government Relations for the Episcopal Church, where she oversees the church’s advocacy on national and international policy issues. With a focus on the environment, refugees and immigration, and international development and conflict, she leads a team that engages Congress and the Administration, develops strategies for grassroots organizing and mobilization and builds coalitions. Most recently, Blachly was the senior policy advisor for Africa in the Office of Religion and Global Affairs at the U.S. Department of State, where she worked with religious communities throughout Africa, including in Mauritania, Chad, Nigeria and Ethiopia. From 2007- 2008, Blachly was acting chief of the Strategic Communication Division at U.S. Africa Command in Stuttgart, Germany. Prior, she served as the special assistant to the principal deputy undersecretary of defense for policy in the Office of the Secretary of Defense, where she focused on humanitarian assistance, disaster response and peacekeeping. From 2003 – 2006, Blachly was a research associate in the Post-Conflict Reconstruction Project at the Center for Strategic and International Studies. She has conducted fieldwork and research in Sudan and South Sudan, Kenya, Afghanistan and Oman, and she has published on civil-military relations and collaboration in complex environments. She received her B.A. in philosophy from Williams College and her M.Div. from Harvard University. Also speaking at the baccalaureate service are this year’s recipients of the Algernon Sydney Sullivan Award, Kayla Sylvester of Yankton, South Dakota, and Conley Hurst of Little Rock, Arkansas. Sylvester and Hurst were selected by the faculty as individuals who best demonstrate high ideals of living, spiritual qualities and generous service to others. During the commencement ceremony on Thursday, W&L will recognize 22 retiring members of the faculty and staff, who represent a total of more than 605 years of service. Two graduating seniors have been awarded Fulbright grants for postgraduate international work. John Dannehl of Atlanta, Georgia, will teach English in the La Rioja district of Spain, while also working on engaging the public in the form of a video blog about recent Spanish history, specifically the repercussions of the Franco dictatorship on Spanish culture and politics in the 21st century. Harrison Westgarth of McKinney, Texas, will work in the lab of Drs. Amilcar Tanuri and Loraine Campanati, at the Federal University of Rio de Janeiro, who are working on establishing an animal model of Zika virus infection that exhibits both adult and congenital infections that can be used for pathogenesis studies and antiviral testing. Two other seniors also received scholarships for postgraduate work. Sierra Noland of Shoreline, Washington, received a Critical Language Scholarship from the U.S. Department of State, to participate in a language and cultural immersion program in India. Colin Wallace of Crozier, Virginia, has been awarded a Rotary Skelton/Jones Scholarship, providing support for one year of post-baccalaureate study outside the U.S. In addition, Pasquale Toscano is among the 2017 class of Rhodes Scholars. Toscano, who graduated in December, plans to pursue a master’s in English and a master’s in Greek and/or Latin languages and literature at the University of Oxford in England. The Class of 2017 hails from 35 states, the District of Columbia and nine other countries. In the event of rain, events will be held at Virginia Military Institute’s Cameron Hall, and the University community will be notified by broadcast e-mail, a notice on the University’s website and other means. Full details on all commencement activities at W&L can be found at www.wlu.edu/commencement. The commencement ceremony will be streamed live online at https://livestream.com/wlu/ugrad-2017.